Bent wheel? Worn-down tires? We’ll get you back on the road. Damage: If you’ve run over a curb, hit a pothole on the highway, or been in a fender bender, you may need to have your wheel (or wheels) replaced. 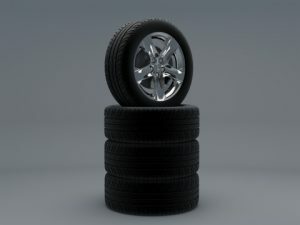 In most instances, wheel damage will actually just be cosmetic. Wheels are built to handle tons of force (literally). However, a big bump in the road may leave your wheel bent, structurally unsound, or missing metal. If that’s the case, then your wheel won’t be able to support a tire, and you’ll have to get it replaced. If you’re not sure whether your wheels are still road ready, just bring your car by the shop. Aesthetics: On the other hand, you may just have a few scrapes on your wheel. It’s easy to get scrapes and dings on your rims. Let’s say you take a turn too tight. Now you have a nice long scrape from the curb. Or perhaps you got a bit risky while off-roading. Don’t fret, we can replace your rims to make your car look whole once again. If you’re simply seeking to upgrade the look of your wheels, we can do that too. No Tread: Your tires are dangerous without tread. Not only will you lose control (especially on a wet or snowy road), your tire could burst at any time. Take a look at the tread of your tires—you should have at least 1/16 inch of tread left on your tire to be roadsafe. You can use a penny to check: Just take the penny, hold it so that Abe’s head is upside down, and place the penny in the tread of your tire. If you can’t see all of Abe’s head, then your tire tread is adequate. If all of Lincoln’s head is exposed, it’s time to take the car into the shop. Age: Rubber does lose its integrity over time. If you have been running on the same tires for a decade or more, it may be time to have them replaced. Tires can crack and lose their structural integrity as they age, and that can leave you on the side of the road, pulling the spare out of the trunk. Punctured Tire: It’s inevitable, tires get punctured. It might be a nail in the road. It might be a scrape on the sidewall. While you can get a plug and patch, it’s best to have the tire replaced. Punctures on the edge or sidewall of your tire cannot be repaired. Complete Blowout: If you’re cruising down the road at 65 mph, a flat may cause your tire to completely rupture and shred. Get to the side of the road safely, stop, and give us a call. Performance: If you have standard tires, you may need an upgrade. Whether it’s to cope with the weather on the roads (with snow tires or all season tires), or to improve your vehicle’s traction, even on the tightest turns (with performance tires), we can help. We’ll ensure that your vehicle is safe, and performing as you’d like. Tire and wheel replacements are just a couple of the many services that we provide here at our City Park West and Lakewood mechanic shops. View our full list of maintenance and repair services, and schedule service for your vehicle today! We work with all sorts of vehicle makes, including Jeep, Subaru, Toyota, and much more.